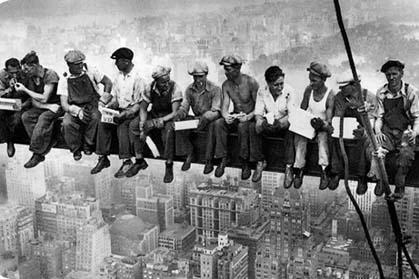 On September 29th 1932 Daredevil photographer Charles Ebbets took a legendary photograph showing 11 workers having a lunch break on the 69th floor of the RCA Building (now the GE Building) 850 feet above New York, during the last months of construction. Most of the men have now been identified by family members. The men at the extreme left and extreme right are thought to be Matty O’Shaughnessy and Patrick (Sonny) Glynn, both from Shanaglish, near Gort, County Galway. The two emigrants had left Shaneaglish in Galway in the 1920s destined for a new life in America. The man sitting fourth from the right is Francis Michael Rafferty and to his right is his lifelong best friend Stretch Donahue. On the same day Ebbets took another photo of the same workers called Men Asleep on a Girder, which shows the same workers napping on the beam. In this photo at the extreme left and extreme right of the photo are Matty O’Shaughnessy and Patrick (Sonny) Glynn, who were in the south of the county. Most of the men have now been identified by family members. The man sitting fourth from the right is Francis Michael Rafferty and to his right is his lifelong best friend, Stretch Donahue. On the same day, Ebbets took another photo of the same workers called “Men Asleep on a Girder,” which shows the same workers asleep on the beam. To mark the world premiere of Lón sa Spéir at the Galway Film Fleadh and Galway’s connection with the workers on the beam, Sónta company, with the support of Coen Steel, will attempt to recreate the famous picture in Eyre Square, on Tuesday July 10 between 12.30pm and 2pm. For tickets, contact the film screening at the Town Hall by calling 091 – 569777. Lón sa Spéir will also be shown on TG4 in September. ‹ Dublin Dockworkers Preservation Society Photographic Exhibition.